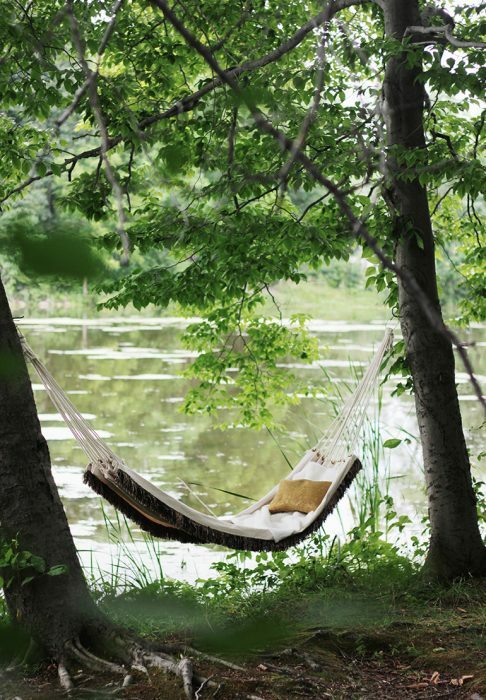 Stitch up a perfect spot for easy summer relaxation with this DIY Hammock. The perfect summer DIY project that can be crafted within an afternoon. Grab a drop cloth, a hammer, sewing machine, rope and nails and tackle this fun project. If you are looking for an excuse to get outside, here is a great start. Celebrate the height of summer by spending time outside where you can really relax. If you love the idea of a hammock in your yard but don’t want to spend a fortune on one at the store, this tutorial will show you how easy and non-time consuming this project really is. Make your backyard an awesome place to hang out this summer. Hang the hammock between two shady trees or in sunken posts. There is truly no better symbol of relaxation than this swanky hammock. Embrace the rest of the season and make this swing and enjoy some good quality family time on it!